Thanksgiving is one of my favorite holidays, and while the actual holiday isn’t until November 24th, I love hosting a “friendsgiving”, celebrating with friends that I am thankful for, before we head our various ways to join our families. These rolls of roast turkey and stuffing are perfect for this sort of dinner party, which is usually a potluck. 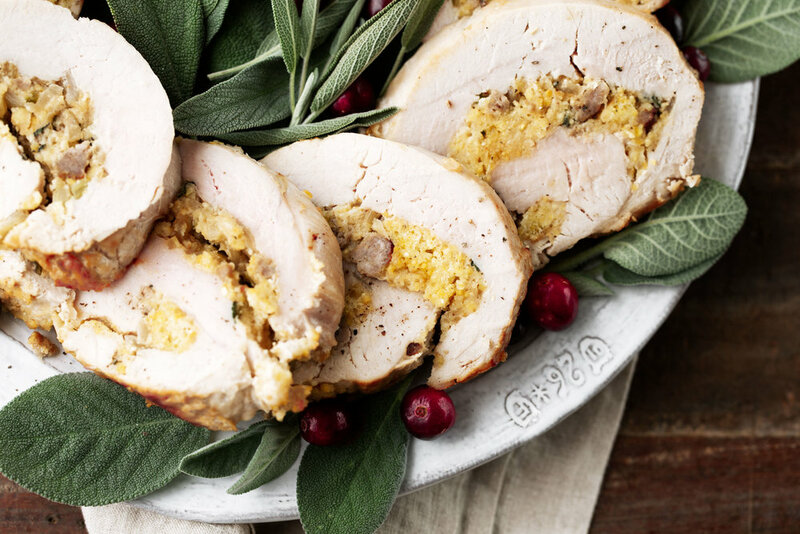 They make for a delicious, flavorful entrée without having to commit the time and effort to making a full turkey. Rather than using typical stuffing inside, I sautéed some sausage and mixed it with crumbled cornbread for a southern inspired filling. Butterfly the turkey breasts crosswise, being careful not to cut all the way through. Place a piece of plastic wrap over one of the open breasts and use a meat tenderizer to pound the breast into a rectangle about 12” x 14” and about ½”-thick. Season with salt and pepper and repeat with the remaining breast. Heat a large nonstick skillet over medium heat, add 1 tablespoon of the olive oil and heat through. Cook the pork sausage until browned and cooked through, about 6 minutes. Remove the sausage and set aside, leaving the fat in the pan then return the pan to heat. Add the onion and celery to the skillet, sautéing until tender, about 4 minutes. Add the wine to the pan, scraping any brown bits off the bottom, then let the wine reduce by half. Add the cooked sausage, cornbread, egg, sage and cayenne to the skillet, stirring to combine. Pour the chicken stock over the mixture and toss to combine until the stuffing is moist but not wet. Add additional chicken stock if needed. Season to taste with salt and pepper. 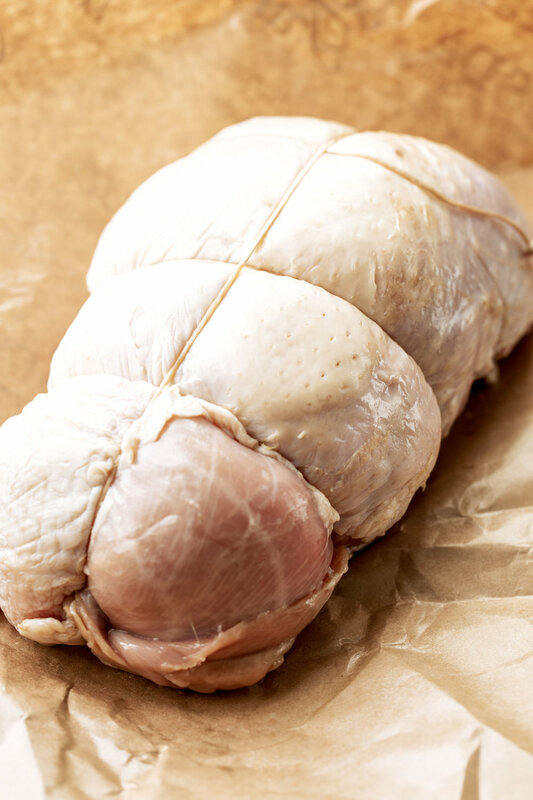 Working one turkey breast at a time - spread half the stuffing over the turkey breast, pressing to adhere. Tightly roll from one long side and secure with butcher’s twine. Repeat with the remaining turkey breast and stuffing. Rub the turkey breasts with the remaining olive oil and season with salt and pepper. Set onto a prepared rimmed baking sheet. Bake until a thermometer inserted into the thickest part reads 165º, about 40 minutes. Let sit for 10 minutes before slicing into 1” rounds.